2. Department of Statistics and Epidemiology, Public Health School, Central South University, Changsha 410078, Hunan, China. MicroRNAs (miRNAs) are highly conserved noncoding RNAs of about 19-25 nucleotides. Through specifically pairing with complementary sites in 3' untranslated regions (UTRs) of target mRNAs, they mediate post-transcriptional silencing. MicroRNAs have been implicated in many physiological processes including proliferation, differentiation, development, apoptosis, and metabolism. In recent years many studies have revealed that the aberrant expression of miRNA is closely related to oncogenesis and is now an intense field of study. Mir-148a is aberrantly expressed in various cancers and has been identified as an oncogenic or tumor suppressor with crucial roles in the molecular mechanisms of oncogenesis. In this review, we have summarized the role of mir-148a in the oncogenic pathways of gastric, liver, breast and urogenital cancers, and in neurogliocytoma oncogenesis. Studying the functional role of mir-148a is crucial in discovering novel tumor molecular markers and identifying potential therapeutic targets. Keywords: miRNA, mir-148a, cancer, oncogene, tumor suppressor gene, biological function. Accumulating evidence has shown that miRNAs play important roles in tumorigenesis, development and clinical therapy. About 50% of miRNAs are located in tumor-related fragile sites or genomic regions, which indicate their potential crucial roles.7 MiRNAs that are aberrantly expressed are related to most tumors, and they interact directly or indirectly with oncogenes and tumor suppressor genes to regulate their expression. Moreover, miRNAs, as oncogenes or tumor suppressor genes, are involved in various cell functions including proliferation, apoptosis, angiogenesis, invasion and tumor metastasis.5,8,9 MiRNAs has revealed themselves as potential tumor markers and are predicted to be novel therapeutic targets. Under normal physiological conditions, the mir-148a gene is expressed in various human tissues including cerebral, heart, liver, thymus, pancreas, renal, placenta, uterus, testis, and the hematopoietic system.10-12 Fu et al.13 found high expression levels of mir-148a in the liver, but no significant difference in expression was found between mature and embryonic liver. Ribeiro-dos-Santos et al.14 found that mir-148a was expressed in normal gastric tissues and was most highly expressed in gastric cardia biopsies. Additionally, highly expressed mir-148a may be involved in regulation to maintain gene expression in gastric tissue stability, and its abnormal expression might induce gastric neoplasms. Nielsen et al.15 detected mir-148a expression and found that exercise could affect its expression levels in blood. Following 12-week continuous exercise, the expression level of mir-148a declined significantly in the blood circulation. Mir-148a has common functions of many miRNA species, and is implicated in a series of biological processes, including cellular differentiation and development. Porstner et al.16 demonstrated that mir-148a expression increased after pre-B cell activation. Next, upregulated mir-148a expression promotes the differentiation of activated B cells to plasma cells, and enhances the survival of plasma cells by inhibiting the transcription factors BACH2 and MITF and the pro-apoptotic factors BIM and PTEN. The downregulated expression of mir-148a can be detected in various cancers including gastric, colorectal, pancreatic, liver, esophageal, breast, non-small cell lung and urogenital system cancers. However, upregulated expression of mir-148a can also be seen in glioma and osteosarcoma. The expression levels of mir-148a have been linked to the clinical classification, efficacy and prognosis of the tumor. GC is one of the most common malignant diseases of the digestive system. In recent years, studies have indicated that aberrantly expressed miRNAs contributed to the initiation and progression of GC.25,26 Mir-148a was significantly downregulated in GC cell-lines and in GC tissue samples, and thus served as a tumor suppressor.27,28 The downregulated expression of miR-148a was significantly associated with tumor size, TNM stage and lymph node metastasis, progression and prognosis.29,30 By contrast, Song et al.31 found that mir-148a targeted the single nucleotide polymorphism (SNP) rs6976789 (C>T) to affect the risk and prognosis of gastric cancer. The survival rate of patients with the TT mutation was significantly lower than patients expressing the CC/CT mutation in intestinal-type GC. CC is one of the most common malignant diseases of the digestive system in which the prevalence has increased worldwide due to rising living standards and an altered dietary structure. CC is a polygenic, multi-factorial and multi-step disease process, in which miRNAs are involved. Takahashi et al.32 discovered that mir-148a was significantly downregulated in CC cells and tissues. The downregulated expression of mir-148a was associated with the poor prognosis associated with stage III patients and the treatment response of stage IV patients after adjuvant chemotherapy. Tsai et al.33 showed that miR-148a had substantially different expression levels in early and non-early relapsed stage II and III CRC tissues and lower levels of mir-148a expression were associated with significantly shorter disease-free survival(DFS) rates and poorer overall survival(OS) rates. The downregulated expression of mir-148a was determined in PC tissues and various PC cell-lines.34 Hanoun et al.35 believed that downregulated mir-148a was linked to hypermethylation of the coding regions in PC and in epithelial tumor tissues. In addition, detection of mir-148a expression and its methylation could be an auxiliary indicator of PC development and chronic pancreatitis. Some special abnormally expressed miRNA species were linked to certain clinic-pathological characteristics including metastasis, recurrence and prognosis.36 Heo et al.37 found that mir-148a was clearly downregulated in HCC tissues as compared to the adjacent control group. The expression levels of mir-148a with microvascular metastasis was lowerer than those mir-148a levels lacking metastasis. The suppressed expression of mir-148a was associated with the high levels of AFP, poor TNM stage, low OS and the recurrence-free survival rate in patients with hepatocellular carcinoma. Pan et al.38 found that mir-148a was negatively correlated with HCC TNM stage and capsular infiltration. Yan et al.39 confirmed that the expression of mir-148a in poorly differentiated HCC was lower than that found in well-differentiated HCC. BC is a very common malignant tumor of female patients that markedly threatens their health. Yu et al.43 argued that mir-148a was downregulated in BC and served as a suppressor gene. Mir-148a was negatively associated with the tumor grade and lymph node metastasis.44 Xu et al.45 verified that the downregulation of mir-148a was related to hypermethylation of its promoter region and presence of the triple negative breast cancer (TNBC) phenotype. Mir-148a could make BC free from immune evasion by controlling the expression of human leukocyte antigen G (HLA-G).46 Thus, it could serve an important role in immunoregulation. Mir-148a expression was attenuated in 80% of NSCLC tissues as compared to adjacent normal lung tissues.47 Mir-148a was downregulated in the blood of patients that was linked to tumor size and lymph node metastasis.48 Mir-148a was apparently downregulated if the size of the tumor exceeded 3 cm or during metastasis.49 Chen et al.50 suggested that mir-148a suppression was associated with advanced clinical stages, low disease free and overall survival rates. 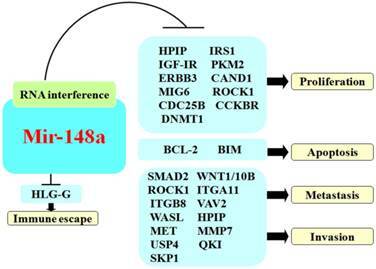 Fujita et al.51 expected that mir-148a was significantly downregulated in PC3 and DU145 hormone-refractory prostate cancer (PC) cell-lines. MiR-148a attenuated paclitaxel-resistance of PC3PR cells by targeting the inhibition of the expression of mitogen- and stress-activated kinase 1 (MSK1) in paclitaxel-resistant PC3 (PC3PR) cells. Lombard et al.52 discovered that mir-148a expression was suppressed in urothelial cell carcinoma (UCC) cell-lines and that overexpression of mir-148a and use of cisplatin and doxorubicin could synergistically facilitate apoptosis of UCC. Zhou et al.53 found that mir-148a expression was down-regulated in ovarian cancer cell lines, and also decreased in ovarian cancer tissues. Gu et al.54 demonstrated that downregulated mir-148a expression identified low OS and short survival time of patients with OC, while upregulated mir-148a predicted both elevated OS and prolonged survival time. This particular cancer is one of the most common primary brain tumors in human subjects. Research has shown that various miRNAs, including that of mir-148a was involved in regulating the development and progression of glioma.55,56 Some studies have illustrated that mir-148a served as a negative risk factor in glioblastoma. Upregulated mir-148a could accelerate the malignant process and was negatively correlated with the survival rate.57,58 In addition, Li et al.59 found that mir-148a was a tumor suppressor gene that was downregulated in the isocitrate dehydrogenase 1 (IDH1) mutant form of glioma due to methylation of the mir-148a promoter, which could suppress its expression and facilitate the malignant process. Ma et al.60 found that mir-148a was especially upregulated in samples of distant metastases by performing blood analysis of 89 osteosarcoma patients. Mir-148a expression was negatively correlated with the tumor size and presence of distant metastases. The high expression levels of mir-148a predicted a poor OS. Recent research has shown that regulation of mir-148a expression occurs predominantly at the levels of the chromosome, transcription and methylation. The amplification and loss of heterozygosity (LOH) in miRNA sites could cause an abnormal miRNA gene copy number.61 Arslantas et al. found that in glioblastoma, the chromosome 7p region gene was amplified.62,63 Brezinova et al.64 discovered that gene deletions frequently occurred in the chromosomal region of 7p 13.2-15.2 of marrow malignant tumors. Therefore, this might explain why the expression of mir-148a is increased or decreased. In addition, Kulkarni et al.65 found that the mir-148a gene expresses the SNP rs735316 and rs111299611, and that a mutation in this region could affect mir-148a expression. The rs736316G/G phenotype or rs111299611 deletion mutation could increase mir-148a expression levels; by contrast, the rs735316A/A phenotype or the rs111299611 insertion mutation could decrease mir-148a expression levels. MiRNA mainly interacts with target mRNA via the seed region of seven nucleotide sequences. Thus, mir-148a can act on different target genes to affect their function in various tumors (Table 1). Mir-148a targeted genes and its function. ↓:downregulation, ND: not downregulation, NSCLC: non-small cell lung cancer, NPC:nasppharyngeal carcinoma. HCC: hepatocellular carcinoma, EMT:epithelial-mesenchymal transition. The role of mir-148a in cancer. Accumulating studies have shown that mir-148a is aberrantly expressed in various tumors, which has been linked to tumor size, stage of development, metastasis and prognosis. However, the biological function and mechanism of mir-148a remains unsolved. Current studies of mir-148a function are limited in terms of cellular and in vitro xenograft experiments; however, the mir-148a gene knockout mouse model is necessary for future studies. Besides the methylation-mediated regulation of mir-148a expression, mir-148a might also be regulated by histone modification and SNPs changes; however, this remains to be verified. Additionally, research results of the relationship between mir-148a and tumors are inconsistent, which requires further study to determine its mechanism in tumors. Thus, mir-148a is predicted to be a potential biological marker and novel therapeutic target in diagnostic and prognostic applications. This project was supported by the National Natural Science Foundation of China (Grant No. 81472860) and the Construct Program of the Key Discipline of Basic Medicine in Hunan Province. All authors declare that they have no any conflict of interests. Corresponding authors: Xiaoning Peng, MD. Department of Pathology and Pathophysiology, Hunan Normal University Medical School, Changsha 410013, Hunan, China. Tel: +86-13786169507 Fax: +86-21-64085875 E-mail: pxiaoningedu.cn or Xiaomin Zeng, MS. Department of Statistics and Epidemiology, Public Health School, Central South University, Changsha, Hunan410078, China. Tel: +86-13467630366 Fax: +86-21-64085875 E-mail: zxiaominedu.cn.